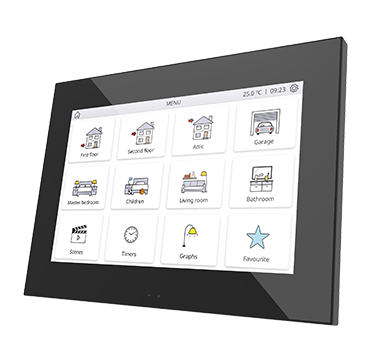 Z70* Z70 is a color capacitive touch panel with 7" display. 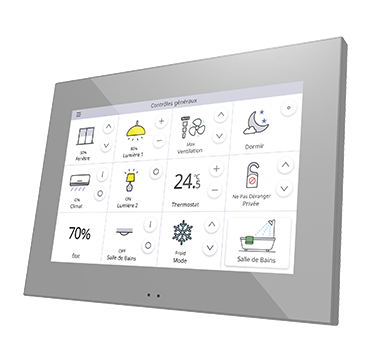 Z70 is a color capacitive touch panel with 7" display. Complying with minimalist aesthetics, provides a total control in smart homes. The proximity sensor built-in makes the screensaver appear when the touch panel is not being used and the luminosity sensor adjust the brightness automatically. Z70 incorporates an internal temperature probe, thermostat and 4 analog-digital inputs. It includes USB and Ethernet port for configuration download. Installation in standard double mounting box. Smartphone Control License – Remote control from smartphones and tablets through the free mobile app. 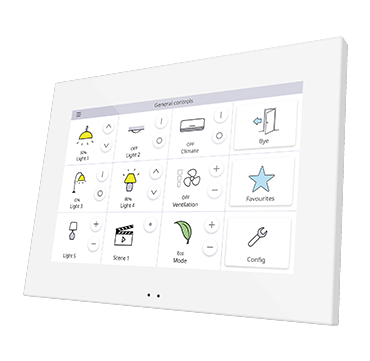 Video Intercom License – Integration with the video intercom Zennio GetFace IP . Video Call License – Reception of calls from video intercom Zennio GetFace IP in mobile app. Accessories: temperature probe, motion sensor.